If you are short of time, the answers to the following 3 questions should let you know all you need to about the Sonicare Essence+. If I have missed something, let me know in the comments. If you want more detail, you can read our full Sonicare Essence Plus review further down the page. Manufactured by one of the leading and most respected brands within the dental industry, there is nothing drastically wrong with this toothbrush. But, for just a little extra spend you can, in my opinion, get a better toothbrush. The Sonicare ProtectiveClean 4100 is a much better option and our choice. It is more expensive, but it addresses the negatives of the Essence+. The cleaning action is different, but another great option is Oral-B’s Pro 1000. Slimmer than the Essence, it has a slightly different look and feel in the hand, but is equally capable, although perhaps let down by the battery life a little. 3. Where’s the best place to buy the Sonicare Essence+? There is not necessarily a ‘best’ place to buy the brush from. In the price comparison table below we have included various US retailers stocking the Essence Plus. Check the links to see which is cheapest, and always buy from a retailer you trust. It’s always worth checking eBay for bargains too. This is not an all singing and dancing electric toothbrush. Instead it is an entry level brush that looks to offer the basics of an electric toothbrush on a budget. It is an evolution of the hugely popular Essence. The + version has the benefit of a greater range of interchangeable heads and an a battery status icon. It’s a chunky and weighty brush handle and is not the best you can buy for the money, but it does deliver a lot of value for the price it is sold at. At the time of writing there are 4 different versions of the Sonicare Essence+. What differentiates them is the color of the brush handle and the brush head that is supplied in the box. The 4 versions are as follows. The price and availability may vary between sellers. What are the benefits and drawbacks of this electric toothbrush? Clean – The clean is going to be superior to that of a manual toothbrush and will remove more plaque and bacteria to give you healthier teeth and gums. Features – Automatic power off and the Easy-Start programme are premium features and normally would not expect them on a brush of this price. Battery life – Better than the Oral-B equivalent brushes. Size & weight – This is not the slimmest of the lightest brush in fact this is one of the heaviest and thickest brush handles on the market. Battery life – Poorer in comparison to most other Sonicare models. The Essence Plus (+) that I am reviewing here is an evolution of the Essence, a long standing, well respected and cost effective brush within the Sonicare range of toothbrushes. You can learn about all the differences between each in our Essence vs Essence+ post. The key difference to note is, the Essence+ addresses what was one of the bigger restrictions, the brush heads. Ditching the screw on E-Series brush heads, the + accepts the standard range of interchangeable heads on offer from Sonicare. This means more choice for you and I. You will have seen the images already I suspect, but this electric toothbrush looks pretty much as you might imagine. It is fairly clinical looking with the gloss White body, but a slight personality is added via the colored accents on the handle. These color accents depend on the model you buy, but colors include Black, Light Blue, Dark Blue and Mid-Blue. The body of the brush is not perfectly circular. With a slight squaring on the right and left edge, this actually helps make it a bit more grippy in hand. It is on these sides that rubber grips run. Wider at the bottom tapering and thinning towards the upper half of the brush handle. Thicker and heavier than most other electric toothbrushes, this is for me not the best example of design and portability. It is however arguably an improvement over the cheaper Essence. OK, it works and it is easy to hold onto in hand because of the size. I suspect you, like me, would prefer the slimmer and lighter Oral-B Pro 1000 or the 2 Series from Sonicare. At the top of the brush handle is the metal shaft that protrudes from the motor inside the handle. This has a slightly different look to most Sonicare models. Don’t panic. The range of interchangeable brush heads all fit. Just push the brush head on and pull them off as and when you want to change it. With the head fitted, you will notice that there is a slight angle to the fitting. What this means is that the brush head tilts more into the mouth rather than being in perfectly straight alignment with the brush handle. Ultimately this helps with the positioning and reach of the brush to the back of the mouth. On the front of the brush handle is the Philips Sonicare logo towards the top in a light grey font. Below this is the one and only button on the brush. The convex button is color matched to your brush variant and matches the rubber grips. It has a power symbol on it and is what turns the brush on and off. The rest of the front panel is all White with the exception of a battery symbol right at the bottom. There is an LED behind the plastic that shines through at the end of a cleaning session and when on charge. An addition to the Essence+, the original Essence does not have a battery status icon. Flip the brush over and there is nothing to speak of. It is smooth to the touch with the exception of a raised piece of rubber at the very bottom of the handle. It is shaped in such a way that when the brush is laid flat it stops the brush from being able to roll. On the base of the brush is the recess into which the prong on the charging stand fits. There is a gap between the outer case and this base plate, but seals inside stop water reaching the battery and motor. Electronics are sealed inside the handle and the brush can quite happily be rinsed and washed off in water, but avoid submersion. The fit and finish on this brush is good but on very detailed inspection things like the gap show how the design and build is perhaps a little more fitting of the price tag. To get cleaning, you simply need to press the power button. Once pressed it will launch into the 1 and only cleaning mode which offers up to 31,000 movements per minute to the brush head. There is a simplicity and efficiency to having just 1 mode. It feels like it is all about getting the job done than offering so much choice you don’t know what to choose. Being Sonicare, the clean is good and my mouth felt fresh after each use. How well it cleans will to some degree be influenced by you. Whilst the different brush heads can have some impact, the way you hold and move the brush around the mouth will have the greatest influence. More powerful than the brushing from any manual brush, the clean is invigorating. But, do note, that the technique to brush your teeth with an electric toothbrush is different to that of a manual brush. Learn the difference and you will be grateful. Oh and don’t scrub the teeth, the bristles need only skim the surface. Depending on which variant you opt for will depend on the brush head you get. All of these are interchangeable with this brush handle. This means you can pick the head you prefer most and fit it to the brush. The ProResults is a good all round brush head that helps deliver a super clean to the teeth and gums. No doubt you are aware that it is important to replace the brush head regularly. Every 3 months is the general recommendation, sooner if the bristles are worn. Every head has a set of reminder bristles that fade from a Blue to a pale Blue/White color over time. You can use these as a visual reminder as to when you need to replace your brush head, if you don’t remember when you last did. As the brush is turned on the built in timer and pacer kicks in. At 30 second intervals there is a slight pause in the brush head motion which changes the sound emitted from the brush and stops bristle movement, signaling to you to change quadrant of the mouth when cleaning. There are 4 quadrants in the mouth, upper right, upper left, lower right and lower left. The theory is you send 30 seconds cleaning each to get a relatively even clean across the mouth over the 2 minute cleaning cycle. When the 2 minutes is complete, the brush automatically powers off, signalling the end of the clean. Automatic power off is a simple but great touch that conserves battery life and offers convenience. When running the brush is actually quite quiet. You do get quite a strong vibrate/humming noise, but it is quieter than most Oral-B models that have a much more mechanical sound to them. A great feature for electric toothbrush newbies is the the ‘Easy-Start’ option that is available here. The Easy-start feature gradually increases the sonic power over the first 14 brushing sessions. Brushing must last at least 1 minute to properly advance through this ramp-up cycle, but it is a great way to more slowly adjust to the increased power of an electric brush compared to the trusty manual. Aside from the brush handle, brush head and documentation, you also get a charging stand included in the box. Sit the brush on it to replenish the battery inside the handle. More on that in the ‘battery life’ section of this review. No travel case is provided in the box, but for the price this is no surprise. You do get a simple travel cap that fits over the bristles on the brush head to protect it in transit, but it is easy to lose. For peace of mind there is a 2 year warranty, should anything go wrong. Despite my concerns about the build I would not be worried about the reliability. Inside the brush handle is the battery. It is built in and not user removable. It is a Nickel Metal Hydride (NiMH) battery. Sonicare do tend to offer more brushes with Lithium-Ion (Li-Ion) batteries, but at this cheaper end of the scale, the NiMH allows them to hit particular price point more easily. As a consequence of this battery technology, the battery it is larger and heavier, hence the size and weight of the Essence+ brush handle. It offers a battery life greater than many popular Oral-B models. 10 days usage time is possible from this. Oral-B tend to offer just 7. Based on 1 user, brushing twice a day for 2 minutes, that is 40 minutes of running time between charges. Provided in the box is a charging stand that the brush sits on. About 3.2 feet in length the power cable is hardwired into the charging stand. A small but significant touch in my opinion is the fact that the charging stand supports a wide range of voltages,110-220v. . This makes is much easier when travelling, particularly internationally. If you share the brush handle, you will get the same usage time, but will need to recharge more frequently. 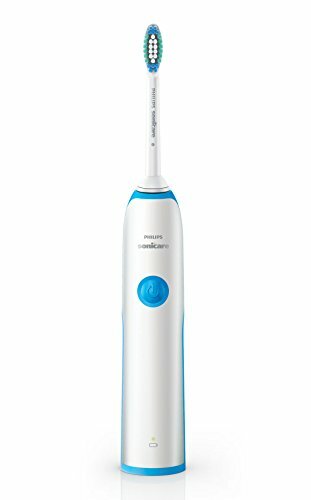 The automatic power-off feature found on this and many other Sonicare brushes is very useful to you and I as users in not only notifying us of the end of the cleaning cycle but conserving power. To fully recharge the brush will need to be left on the charging stand for up to 24 hours. You need not always fully recharge it and you can always pop it back on the charger when you are done with it. In fact it is perfectly fine to leave the brush on charge the whole time. A battery status icon on the handle does indicate the condition of the battery. It is visible once the brush is turned off or automatically powers off. If it is a solid Green color then the battery condition is good and you have anywhere up to 20 cleaning sessions left in the brush. If the battery indicator is a flashing Orange and you get 3 beeps at the end of the clean, there is enough power for 2-5 cleans in the battery. If you get the same flashing Orange light and 2 sets of 3 beeps you have just 1 clean left in the brush. If completely out of power the brush will not turn on until there is some charge in the brush. $39.99 is the recommended retail price of this toothbrush according to Philips own website and for the most part, retailers sell it at this price too. Do a bit of shopping around and you can pick up 1 or 2 of the variants for a bit less, typically around $30. We have included a live price comparison for the Essence+ here. Of course this does depend on the retailer. Given that the less featured Essence is about $25, it’s not surprising that the price of the plus is at least an extra $5. Here at Electric Teeth to try and form some sort of baseline for cost comparison, we take the price of the brush handle, the replacement brush heads over a 3 year period and work out the total cost and daily cost. The Sonicare Essence costs $118 to buy the brush and brush heads (1 x brush handle at $30 + 11 brush heads at $8 each) or just $0.11 cents per day to own. There is no denying that you get value here. Believe it or not, this more feature rich plus version actually works out cheaper than the basic Essence model?! Well working on typical selling prices, the cost of replacement brush heads are more expensive with the Essence ($10 each). So, although the plus is more expensive to buy initially, ongoing it becomes cheaper because brush heads are around $8 each. I still can’t help but think, spend $40 and you can get the ProtectiveClean 4100 or the Oral-B Pro 1000, which I believe are better. These brushes have a suggested retail price of $70 but are very often sold for quite a bit less. Prices are always changing and my opinion may well be different to yours, so use the information presented in this review to make an informed judgment and pay a price you are happy with. Quality and reliability is something I generally associate with Philips and the Sonicare brand. Their brushes are generally well built, made from strong, quality materials. For the most part this is true with the Essence+. However this is one that if I am being really picky, the quality does not feel quite as good. It is not bad or poor on any level, just finish to the rubber grips right on the edges isn’t quite as sharp as one might have expected, but I need to bear in mind the price. Not that price should be a determining factor, but it does have a part to play. On the base of the brush, the gap between the body and the base cap is greater than I would have imagined. There is likely a good seal inside, so I would not be too worried, but it’s another very small difference between the more cost effective and premium models. With all this said, the brush is weighty and solid in hand and Sonicare back it up with a 2 year warranty, which in truth is very good. Only long term tests really tell how well brushes fare and we will be sure to report back is any big issues arise from extended testing. All things considered, there are lots of things to like about the Essence+. A good clean, an ok battery life, built in timer and water resistance. However, I would be lying, if I said this was the best brush you can purchase. If you budget is particularly tight, this variant actually works out cheaper long term, than the Essence. If you can afford to spend an extra $10 or so, then you will get much better return in my opinion from the ProtectiveClean 4100 from Sonicare. Is the Sonicare Essence+ an oscillating brush? What cleaning modes does the Essence+ have? The brush head that the Essence+ comes with very much depends on the variant you choose. There are 4 different options that offer either a DiamondClean, Sensitive, SimplyClean or ProResults Gum Health brush head in the box. Sonicare do have a range of alternative brush heads that are compatible including, ProResults, ProResults Gum Health, Sensitive and Sensitive that can be purchased as alternatives to those included in the box. Does the Essence+ have a pressure sensor? Does the Essence+ have Bluetooth? Does the Sonicare Essence+ come with a warranty & how long is it? If purchased new from an approved retailer the Essence will come with a 2 year warranty. Does the Essence+ have a built in timer? The battery lasts up to 40 minutes, which if used on the standard clean mode, this is 10 days based on 2 cleans per day. Yes, a charging station is included with the Sonicare Essence. The Essence+ charging station or brush head holder has not been designed to be fixed to a wall. Can I use the Essence+ in the shower? Yes. The Essence is water resistant so if you choose you can use it in the shower, but do avoid submerging it in water.